Join us for a community discussion on the Diversity Advantage, when inclusion is transformed into full equity. The discussion will be sparked by Mary Scipioni (Landscape Architecture), Kristin Hocker (Diversity & Inclusion) Luticha Doucette (Disability Advocacy), Tatyana Bakhmetyeva (Gender, Sexuality and Women’s Studies), and Mara Ahmed (Activism/Art/Film). Please note that the Gandhi Institute has a shoes-off policy so please bring extra socks and/or indoor slippers for comfort! 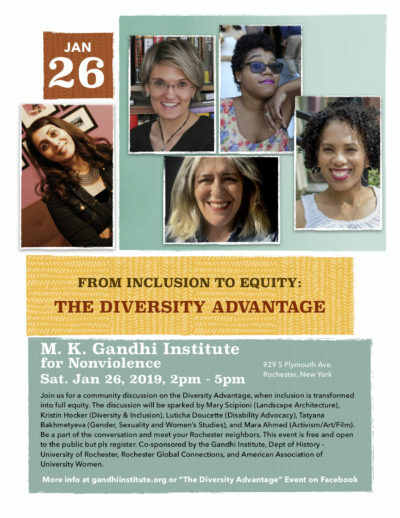 Co-sponsored by the Gandhi Institute, Dept of History – University of Rochester, Rochester Global Connections, and American Association of University Women.